Dimension 4.5" x 7" x 1.5"
Finial PCQ-RC has a white case. The PC Quilter is normally run from your PC. 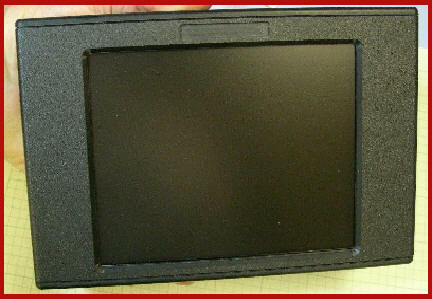 There is an affordable optional device that you can purchase with your PC Quilter or add later. This device is called the PC Quilter Remote Control (PCQ-RC). It connects to the same PC you are using with the PC Quilter using a 15 foot serial cable (flexible and small diameter). It is a hand held color touch screen (LCD) device that lets you run most of the the PC Quilter functions right at your sewing machine or sewing head without returning to your computer screen. It works with short-arms, mid-arms, and long-arms. You simply start the quilting software on your PC and after the initial startup, it tells you to "go to the LCD screen". At the hand held LCD screen, you can select the pattern file you wish to quilt, make any adjustments to it that you could normally do on your PC, and sew it out including sewing the pattern again or selecting another pattern. You can change the length, width, number of repeats, the offset (for overlapping row patterns) and on and on. 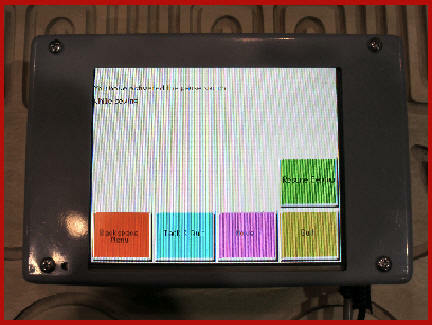 Any commands that can be put in a pattern file can be answered on the LCD. You simply touch the screen buttons to choose an option or use one finger to "poke in" any number your commands request (if any). You are not required to use commands that cause the LCD to ask questions - it is just a feature that allows you to change your pattern, without any meaningful restrictions, right at the sewing machine. Even the simpler "Math Help" options can be used from the LCD. No expensive pattern manipulation or layout software is required. You can use such software if you desire but it is not needed in most cases. That software is also not required to digitize patterns - the PC Quilter includes digitizing software. If you need more advanced digitizing features, third party software which does that is recommended. If you don't need them, the savings may pay almost half the cost of the PC Quilter Remote Control. it is not a third party add-on device that requires you to make unauthorized wiring changes to your PCQ. does not require any installation except to plug in the power supply and plug it into your PC (serial port or USB). If you plug it into your PC's USB port, and you are using a USB port for your PC Quilter, you may need an inexpensive USB multi-port hub which most users already have. There is a minimal learning curve because the software mimics the current PC Quilter software (it is the same software you are using currently). The PC Quilter Remote Control works with our current model of PC Quilters (electronics pcb version 4). In the near future, it will be available for all past PC Quilters as well (just needs more testing). One purpose of the resize feature is to change the height and width of a pattern to fit a space. There are other capabilities using this feature with the PC Quilter. You can mark up to 20 points to define an odd shaped area. Selecting a fill pattern screen, it will fill that area with the desired choice of fill patterns (see fill pattern documentation). It is suggested that after marking the points and selecting the pattern, you do a draw before sewing. This to ensure that you know the particular fill pattern you chose will produce the desired results within the area you just defined. To do the next area of the same shape, even if just a quilt block, you do not need to define the points again. Once is all that is needed. You can also define an area for a panto or border using the same process. The program will resize and calculate the number of repeats to fill the space.